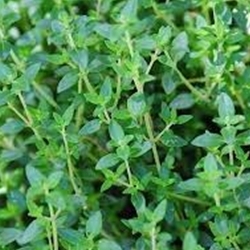 Wonderful herb used in many dishes. Available in a 2x3 inch cell. All plants are certified organic. Select here for transplant information, pick up and order dates. Petite leaves and mini spikes of pinkish lavender flowers atop woody stalks. A very versatile culinary staple which can successfully flavor any meat and vegetable dish. Perennial.